Below is the shawl on March 27 and January 19 respectively. I do expect to find this shawl beautiful even if I did knit it myself. It has the hushed quality of its photo in Folk Shawls. However, I don't expect to make any more shawls. Of course this is a lie. While I have gone off of shawls because they just don't look that good on me and I don't know anyone else who would wear one, I do have plans for more shawls. I have yarn for one or two more Clapotis. Maybe these don't count as shawls because they are a little scarfy. I also have yarn for a shawl I have long, long admired, a Shetland shawl knit in two right angles around a middle square. But this can be more like a blanket. I also have a warm spot for the Stonington shawl as created by Laura, The Scarlet Knitter, in her exact shade of pink. Luckily I don't have yarn for this. 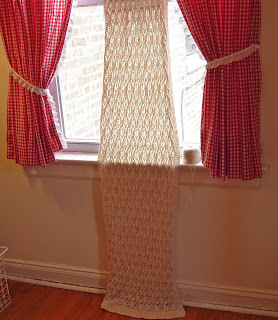 From now on, mostly, I'll confine lace knitting to scarves and sweaters. In looking forward to the completion of Kimono though, I sensed an emerging question. Where would I block such a large garment? Where the cats couldn't lie on it. The sewing room is the only place I can easily keep the cats out of, but there is not a good surface there for pinning. To that end, I found a company that sells interlocking foam mats, Soft Tiles. They seem to have low prices. I ordered 24 1' tiles, which should be enough for the Kimono shawl and any other project. I am happy. I am always happy when I can buy something. I will close today with some garden shots. We had our 20 year old crab apple tree trimmed. 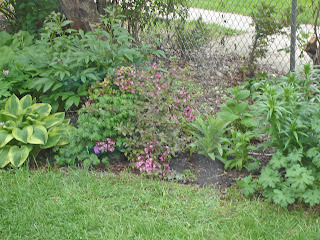 The little pink-flowered shrub is Weigela florida 'Minuet', a charming 2.5 foot shrub with purple-ish leaves. It is also quite old in my garden, and a stellar performer. Thanks for the referral to "Soft Tiles." Just what I need, and so delightfully inexpensive too. The Kimono shawl is looking lovely. It is indeed a peaceful design. I need to go back over your posts and check what yarn you are using. In the pictures it looks very shiny. Intriguing.